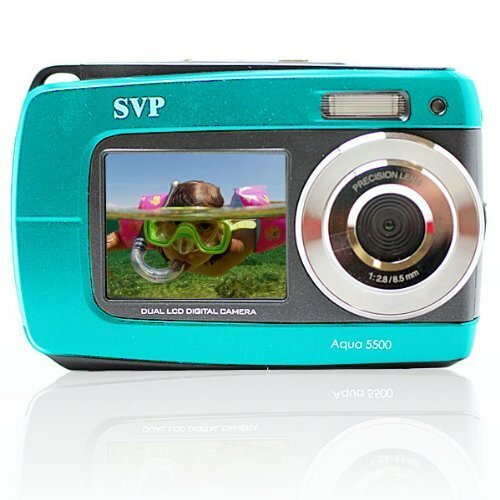 The SVP Aqua 5800 Waterproof Digital Camera features a dual color display with 4x digital zoom. The 1.8 inch front TFT color display is large enough to allow you to see yourself in the shot before taking the picture. 2.7 inch rear LCD display provides easy viewing of the photos. It is a 18 Megapixel camera with a 8.5mm lens. Easy to use and is suitable for any trip! It also does not stop you from capturing the perfect moments underwater! The camera supports up to 32GB of Micro SD card and is compatible with Win XP(SP3), Vista (32/64), Win 7(32, 64) and Mac OS x 10.6.8 or above.